Gracchio coralino or Sooty Oystercatcher?? I recently attended some talks given by the Sibillini Mountains National Park on the flora and fauna specific to the mountains. 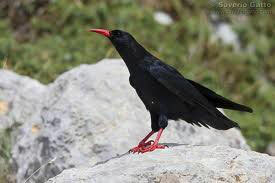 At one point, a photo of a black bird with orange legs and beak appeared on the screen. It was called a gracchio coralino. I'd seen that bird before..... perhaps it was in the hills near La Mela Rosa.... Then I remembered that I had seen it at Bawley Point, NSW in January....with not a mountain in sight but plenty of ocean! Turns out what I saw was a sooty oystercatcher, which looks identical to the gracchio except that the former has an orange ring around its eyes. Amazing that two such similar birds should live in such completely different environments. Not too many oysters in the Sibillini Mountains.